The vegetables will act the part of lasagna noodles. 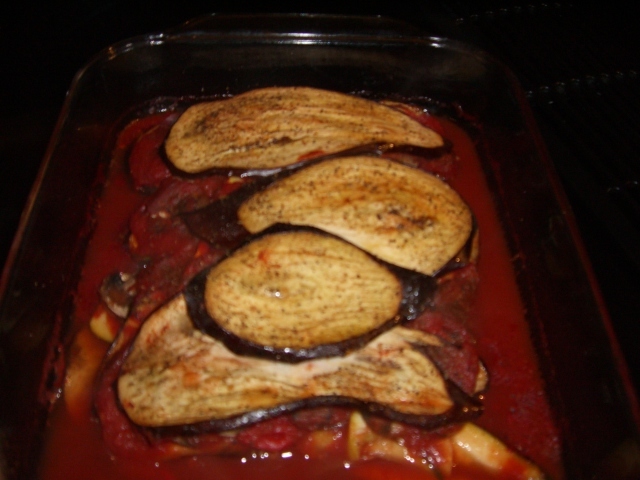 Slice the Eggplant, Zucchini and Yellow Squash all lengthwise approximately 1/8th of an inch thick. To add another dimension of flavor, season the slices with olive oil, coarse salt, pepper and grill. While the veggie layers are grillin’, chop the onion, dice the garlic and saute them in olive oil. Once the onion and garlic begin to sweat and become translucent, add the tomato puree, oregano, coarse salt and white pepper. The base layer (and stabilizing part of layers) will be the Eggplant. Building up from there, layer the zucchini, yellow squash, spinach, mushrooms and a portion of the tomato puree mixture. 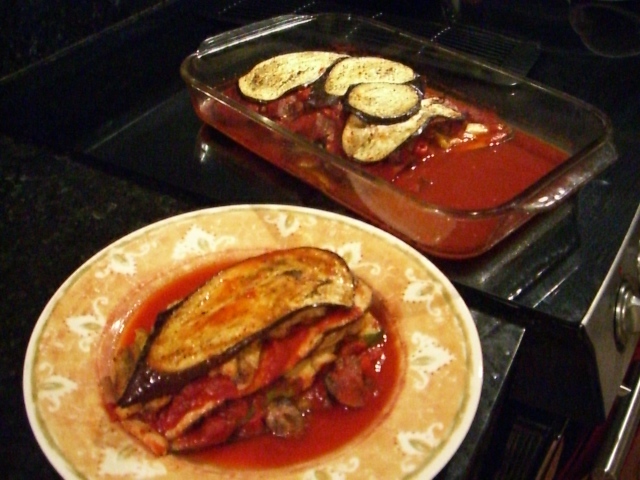 Then repeat – Eggplant, zucchini, etc. The final (top) layer will be Eggplant. Pre-heat the oven to 375 degrees and baked for 45 min. My Part-Italian-SutterGirl Self can’t help but add chicken, italian chicken sausage, or fish to this dish! And….If you’re of the dairy eating kind….dust in some Reggiano Parmesan between layers and on top. Like any Italian dish, the leftovers only get better!! Mangia, Mangia!! Til the next post….Lift Hard & Keep your Fork Lifts Clean! Quinoa, pronounced, “Keen-wa”, oughta be called QuinWow!! 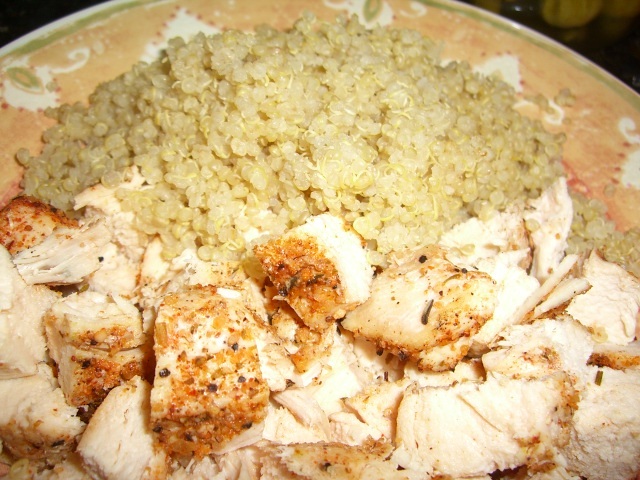 Though classified as a grain, Quinoa is really a seed packed with some serious POWER!! For starters it is a COMPLETE Protein source, meaning that it contains all 9 essential amino acids! Quinoa contains a high level of the amino acid Lysine, offering the key function of tissue growth and repair – a critical factor in the Body Building process! While I enjoy Quinoa as a stand alone side dish (both hot and cold), I recently mixed it up a bit to add both taste and texture to yet another amazing salad and a super festive appetizer option! Check’em out….. Okay, Grill your chicken and season it as you like. I used a Southwest seasoning to spice it up! NOTE: Store your package of Quinoa in the freezer. I read that this is really what should be done for all grain / seed / nut items. It will prevent them from going rancid in your cupboard. 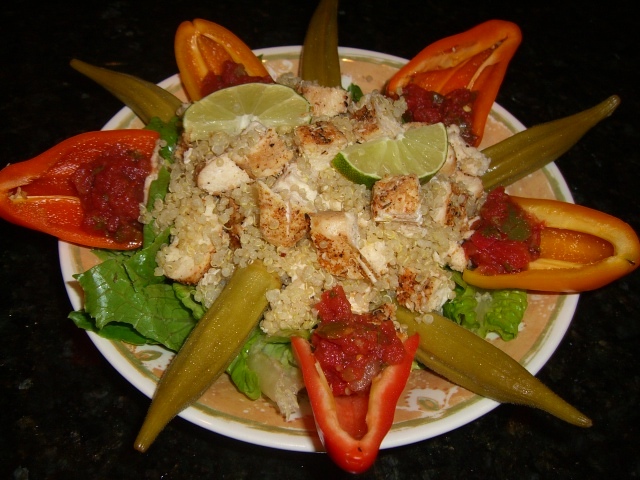 I dice up the grilled chicken, blend it with the Quinoa then pour it on top of the lettuce and mini bell peppers and garnish with the pickled okra & salsa. Squeezin’ a little fresh lime juice on it adds a nice fresh citrus flavor. This is the prettiest little finger food I ever did see! Use all the same ingredients for the salad described above, just stuff the mini peppers with’em!! Half and de-seed the mini peppers. 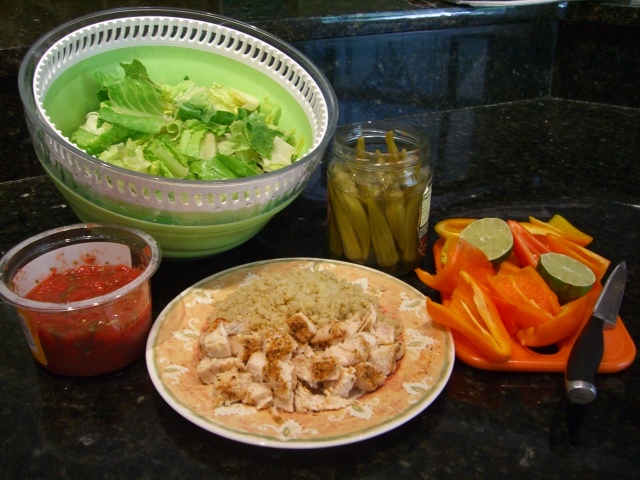 Then place a small piece of lettuce in the pepper half, next add the grilled chicken & quinoa mixture, top with a dollop of salsa & a slice of pickled okra and squeeze a little lime if you like. If you’re not a fan of pickled okra (don’t knock it if you ain’t evah tried it! ), garnish with a sprig of cilantro to make it FANCY! 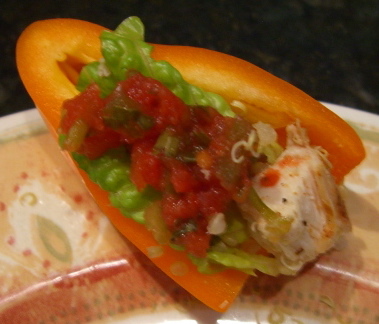 The mini pepper functions as the carrier of all the GOODNESS! 2018 NEW YEAR….NEW YOU…..DÉJA VU…. It’s OFFICIALLY A January 1st REPEAT Y’all!!! Yep…another New Year’s Day marks the First Calendar Square …Day 1 of 365…WHOOP! WHOOP! 🎉 One aspect of that statement is Hard to Believe (the whole “Time Flies” vibe…) and yet it’s obviously what all of our minds anticipate EVERY December 31st. Although New Year’s Day will be the common thought running through our minds, at least between Bowl Games 😜, each of us approaches “The New Year” in our own unique way. Some will have already mapped out their 2018 Goals using spreadsheets, vision boards, apps, etc. Others will ease into the New Year using January as a month of reflection; assessing what went well in 2017 and how to improve the “opportunity areas”, and then formulate their plan forward to attain the outcomes they envision. No doubt there are unlimited scenarios beyond these two examples. Beyond “thoughtful” goal setting and planning there’s another accompaniment to New Year Beginnings – Emotions. The New Year can evoke emotions across the Positive / Negative spectrum; Anticipation, Excitement, Joy, Happiness, Fear, Dread, etc. ; ANY and ALL of which can dramatically impact our New Year Approach. These varying emotions can be conjured up based on how the previous year ended, or instilled within us by upcoming events already filling time slots on our New Year calendar. Again, these possible emotional influencers are limitless. Regardless of Our uniquely designed “New Year Approach” and Our individual Emotions accompanying that process, there’s one COMMON dynamic We All share. As obvious and cliché as it sounds, WE can ONLY Live “One Day at a Time”. And for that we should be both THANKFUL and RELIEVED!! It’s great to approach any New Year with an Action Plan to achieve improved outcomes personal, physical, spiritual, team, business, or otherwise, but it’s the Daily Steps taken COLLECTIVELY that will lead to attaining our desired outcome. Ultimately, it’s our DAILY APPROACH that carries the most Impact in achieving Our New Year Plan. Keeping this thought in mind will help to ward off the potential for feeling Overwhelmed and will also assist in keeping ourselves focused and persistent in pursuing our goals for this specific New Year. More Posts to come pertaining to 2018 New Year / New You…. STAY STRONG & SHARE YOUR STRENGTH! !